Welcome to the Moda Cutting Table! Today I have a little mix ‘n match post with Bella solids that coordinate with the recent collections Lario by 3 Sisters, Happy Go Lucky by Bonnie & Camille, and Spring House by Stephanie Ryan. 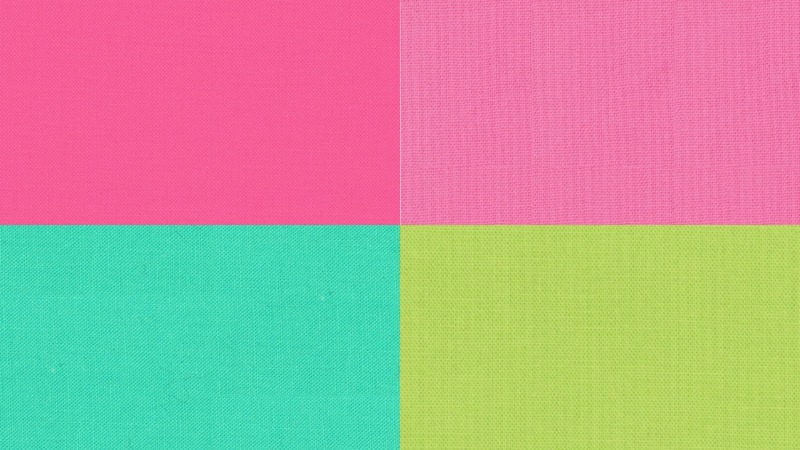 I had some fun mixing and matching fabrics from these collections with my Bella solids color card. It’s always fun to see which solids might work with any given collection. First up is Happy Go Lucky, a delightful collection with wonderful yellows, oranges, aquas, navys, reds, and greens. 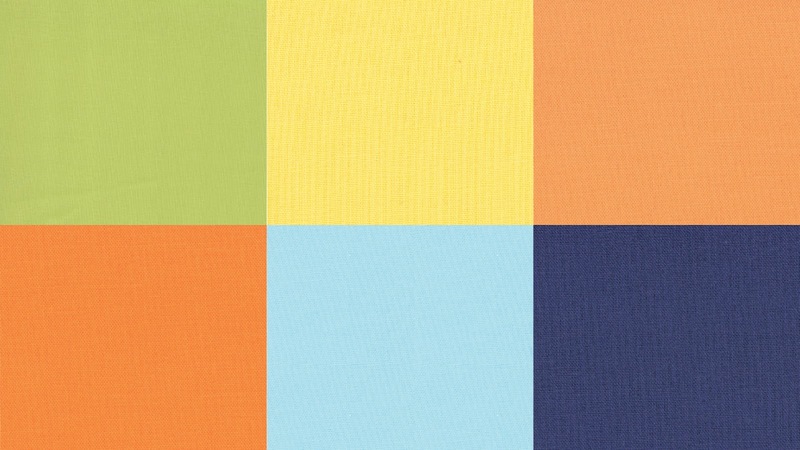 Here are a few Bella solids that work wonderfully with Happy Go Lucky: Pistachio (9900 134), 30’s Yellow (9900 23), Amelia Apricot (9900 162), Amelia Orange (9900 161), Robin’s Egg (9900 85), and Admiral Blue (9900 48). Any of these Bella solids would be terrific for accents, borders and bindings. Lario by 3 Sisters is another recently released collection. The gorgeous colors and prints have a nostalgic feel and are soothing and beautiful! 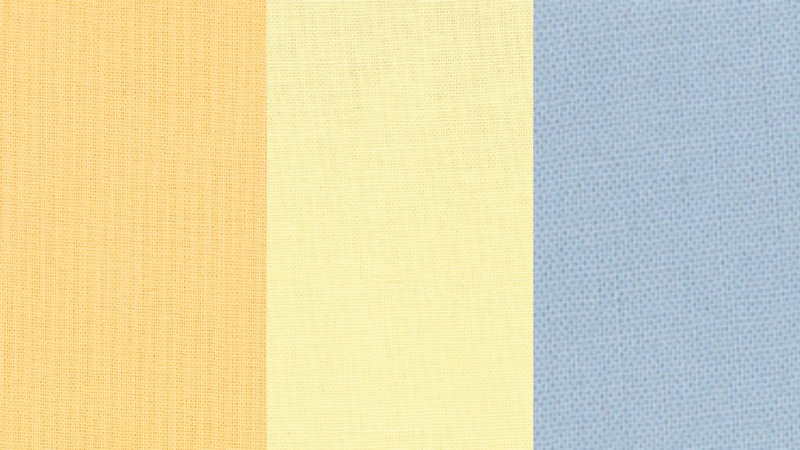 Some Bella solids that coordinate with Lario are: Butterscotch (9900 36), Soft Yellow (9900 148), Cloud (9900 208), and Cherry (9900 230). And finally, Summer House is full of gorgeous colors that say…well…summer! Beautiful Bella solids that will add that special something to your Summer House quilt or project are: Fuschia (9900 190), Peony (9900 91), Peacock (9900216), Summer House Lime (9900 173), and Daffodil (9900 250). For more Bella solids fun…stop by my blog today to see three more Moda Friendship blocks in some great Bella solids combinations. By Sherri McConnellIn Uncategorized3 Comments on Bella Solids…Matching Them Up! Next Next post: Gracie Goes Glamping….and a Giveaway!! Your friendship blocks look amazing !